Bosch's podlike vehicle is intended to demonstrate the supplier's capabilities to make vehicles run by themselves, safely and in a consumer-friendly way. LAS VEGAS -- Robert Bosch, the world's biggest auto parts supplier, is plunging deeper into a new world of Internet-based technologies and vehicle services in a bid to remake itself as what it calls "an IoT company." The supplier of parts ranging from humble spark plugs to electric vehicle powertrains believes there is an enormous opportunity beckoning with billions in business from such new technologies -- even if many consumers don't understand what the term "IoT" means. On Monday, Bosch launched a new IoT identity campaign here at the kickoff of the global electronics trade show, CES 2019. The new public relations effort, built around an advertising theme called "Like a Bosch," will attempt to present the old German company in a cheerful and humorous light as a purveyor of Internet solutions, including vehicles that communicate with their owners and with other vehicles. The identity campaign has begun disseminating Internet videos and viral messages to bring more recognition to Bosch's growing focus on the Internet of Things, or IoT. IoT is the buzzword rumbling through the convention center ballrooms and press conferences here at CES, a show that draws some 180,000 people. And Bosch has become one of the concept's biggest disciples. With an empire worth $47.5 billion in parts sales to automakers in its most recent fiscal year, Bosch is now gathering its various technology initiatives into a new identity -- one that assumes that cars of the future will be intelligent, self-driving and connected electronically to their owners and the cities around them. "Bosch is entering new territory," declared Markus Heyn, a member of the company's board of management. To drive the point further, the supplier is showcasing a Bosch-built self-driving shuttle vehicle concept at the trade show. 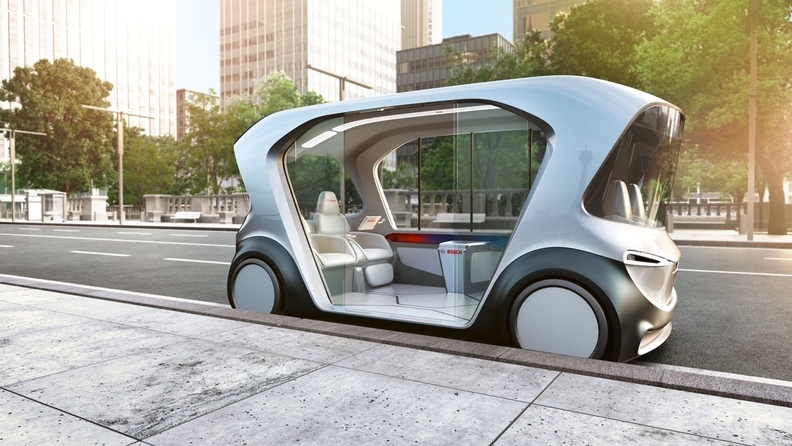 The podlike vehicle is intended to demonstrate Bosch's capabilities to make vehicles run by themselves, safely and in a consumer-friendly way. The company said that in many ways, it is already there -- it simply wants people to recognize it. "Every square inch of this concept shuttle contains existing Bosch solutions, from our e-axle, an electric powertrain that's compact, efficient and affordable, to 360-degree surround sensors for automated driving, to our connectivity control unit for full V2X connectivity and state-of-the-art vehicle computers," Heyn said Monday at a CES press conference. "Bosch has evolved from an industrial enterprise into a leading global IoT company," he said. "Of Bosch's more than 400,000 associates worldwide, 27,000 are software engineers, nearly 20 percent of whom are working exclusively on the IoT." The company said it does not want automakers to get the impression that it will abandon the thick catalog of auto parts that has made Bosch a global powerhouse over the past decades. In its most recent fiscal year, Bosch sold $7.6 billion worth of parts to automakers in North America alone. But Bosch and others believe the role of component suppliers will shift dramatically over the coming decade as automakers develop vehicles that can drive themselves and communicate with other vehicles around them. More significantly, the treasure chest of new technologies will contain vast new business wealth for suppliers that are able to master Internet-based vehicle services. "These days, a lot of companies are trying to position themselves as an IoT leader," Heyn said, including all industries in his estimates. "And with good reason. By next year, IoT market volume is forecast to reach $250 billion." Bosch produces more than car parts, and the company wants its IoT halo to extend to its development of kitchen appliances, such as refrigerators, and industrial products. By 2025, Bosch estimates, companies of all stripes will have invested a total of $15 trillion in products and services to lay claim to IoT business.